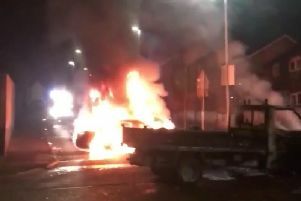 Police in Derry have launched an investigation after a car was set on fire in Ferndale Close on Thursday morning. The incident was reported to the Northern Ireland Fire and Rescue Service (NIFRS) 4:55a.m. One fire appliance from Northland Fire Station was deployed to the scene of the blaze. “The incident finished at 5:30a.m. and is being treated as a deliberate fire. The incident has been passed through to the Police Service of Northern Ireland,” a NIFRS spokesperson told the ‘Journal’.